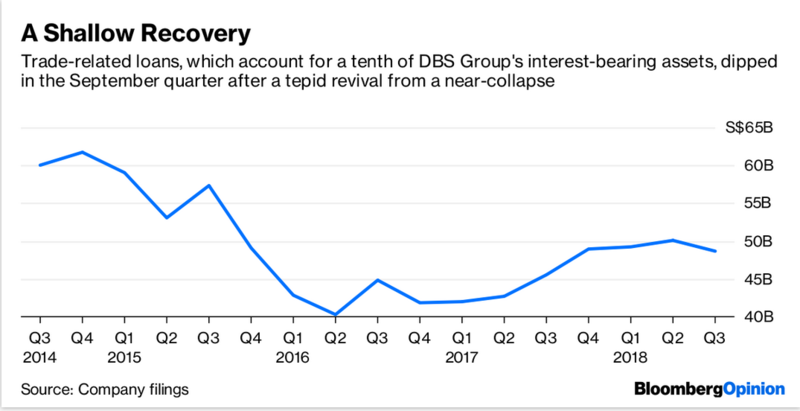 SINGAPORE (Nov 5): Very little went wrong for DBS Group Holdings last quarter. Singapore’s biggest bank, the last to report earnings, posted a 76% jump in net income. Net interest margins widened 13 basis points and credit costs were 71% lower than a year earlier. Investment banking wobbled, but trading income surged to compensate. The joys of being a bank in a rising interest-rate environment may be coming to an end, however. Consider deposits. The cheapest varieties of this staple diet – current- and savings-account deposits in Singapore dollars – fell 1% from June. Including all currencies, overall deposits were stagnant by volume and cost 10 basis points more to procure than in the previous three months. The math still worked out because of a bumper 22-basis-point gain in the yield on the bank’s trade-related loans between June and September, among other factors. But pricing is only part of the equation; quantities are important, too. If the recent dip in trade-financing volumes is any indication, the recovery from a multiyear funk in global trade may not be able to withstand the Trump administration’s tariff war with Beijing. 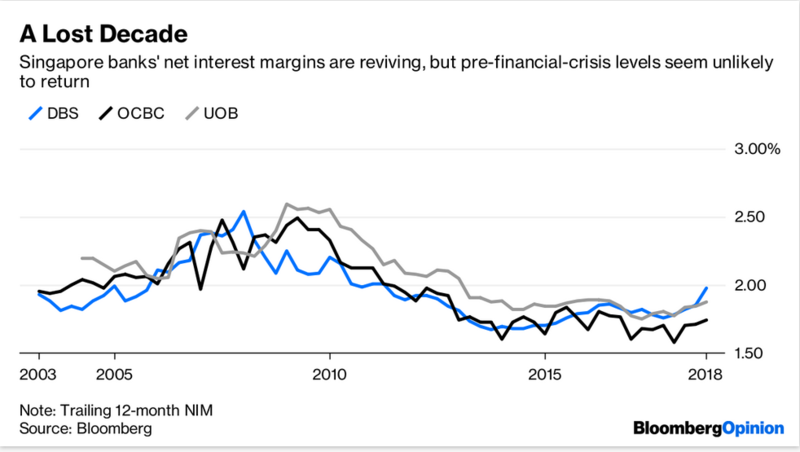 As for pricing, the net interest margin of the three homegrown Singapore banks – DBS, Oversea-Chinese Banking Corp. and United Overseas Bank – is yet to hit 2% on a trailing 12-month basis. The DBS CEO, Piyush Gupta, says he expects margins to widen as two to four predicted Federal Reserve rate increases next year flow through. However, for almost two years interbank rates in Hong Kong and Singapore have lagged US Libor. There’s a good chance that by the time the Fed is done, Singapore banks’ loan profitability will have failed to reclaim the highs it reached before the financial crisis. To that, add the Singapore government’s renewed hawkish stance on the local housing market, and the good times for Singapore banks seem to have come and gone.